I used to hate back day. Now I have now idea why, it’s become probably my favorite day. For me there’s such a fine line between eating enough to lift and feeling too full to really push myself. Hows the intermittent fasting working for you? @Lionfish @funnydad - what is thish push up challenge? I’m really loving it. My brain likes the structure it creates. I mean it’s not exactly that rigid, but I could feel hungry all night and struggle with not eating (knowing I’ve already had my share of calories for the day) vs with fasting, eating isn’t part of my night routine, so there’s really no tug of war. I might slowly add more “eating” hours though. Apparently women do better with 14 hours fasting, 8 hours eating. I did 100 today. Can I still play? 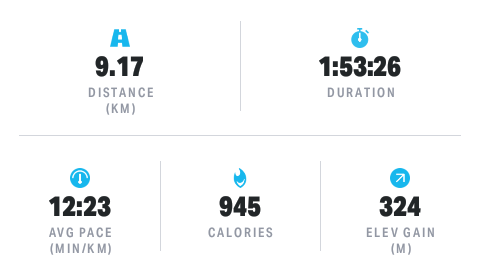 So I started doing this hike for pleasure (hence the leisurely pace), and today I tracked it for the first time. I had no idea it was burning that many calories! I guess I can consider this part of my working on working out! I’m going to do some thinking on how to fuel this 3 times a week. I’m calorie balanced without exercise, and carbs might constitute too much of that. I’m also spending pretty close to my full food budget, so, I’ve got some brainstorming to do for cheap fat/protein to add in. Although, for now I can probably just let the calorie deficit happen, in the short term. Yes!! Great job, that is a lot of push-ups! I consider myself a beginner yoga person - only really got into it with consistency at the start of the year. I highly recommend YouTube yoga with adrienne - she is awesome! I did 2 of her 30 day things and it was great. Not so much part of my workout routine, but part of my stretching and meditation and mindfulness routines. I’ve got some brainstorming to do for cheap fat/protein to add in. -Beans (pinto, kidney, black, garbanzo, etc). Also a carb source. Pretty much various legumes and dairy-based protein sources. Generally pretty affordable, especially if you get dried beans/lentils. With the dairy stuff its key to look out for added sugars. EGGS! Dangit, the whole time I was writing that out I knew I was forgetting a big one. Also, but not for everyone: sardines. I love them. Cheap source of protein and omega-3. Lowest mercury levels of any seafood. I like them in a brown rice bowl with siracha sour kraut. Get the ones skinned and filleted packed in virgin olive oil for an extra dose of healthy fats. Most of my protien comes from eggs and sardines. You just made it easy for me, since you nailed all the other ones. Thanks Ariel, will check that out!